Air nail guns, whether battery-powered or driven pneumatically by an air compressor, will drive a nail when the user simply positions the nailer in the proper direction and pulls the trigger. There are many types of air nail guns, such as brad nailers, finish nailers, staplers and framing nailers. Using a framing nailer to build a fence relieves a lot of the physical exertion involved in building a fence. About the only truly difficult act is digging the holes for the fence posts. Dig your first fence-post hole on the corner of the fence line. Dig the hole about 8 inches in diameter and 2 feet in depth. Place one fence post in the hole, with one face parallel with the fence line. Use your level to keep the post plumb. Fill the hole surrounding the post with dirt. Tamp the dirt in layers with a short section of two-by-four as you fill the hole. Measure 8 feet along the fence line from the center of the first post and dig a second hole. Install a fence post in the same manner as the first, checking to see that the distance between post centers remains 8 feet. Make a pencil mark 12 inches from the bottom of each post (at ground level) and 8 inches down from the top of each post. Place an 8-foot two-by-four just under the two top marks, with the ends centered on the posts. Place the nose of the framing nailer against the board and pull the trigger to drive each nail. Repeat with a two-by-four centered just below the bottom two marks. Repeat Steps 3 though 5 for the entire length of the fence line. Beginning at the first fence post, position a cedar picket vertically against the two-by-fours. This picket should be about 1/2 inch above ground level. Check to see that the picket is plumb. Nail it into place with the nail gun. Position the next picket about 1/4 inch away from the first picket, at the same height. Check for plumb, and nail it into place. Repeat the previous step until the entire fence line is covered with pickets. 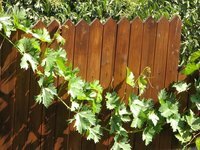 If your terrain is not even, you may need to trim some pickets or adjust your picket positioning to keep the top of the fence level. Whenever working with power tools, always wear appropriate safety gear, including safety glasses.